FILE - African migrants sit outside Holot detention center in the Negev Desert, southern Israel, April 21, 2015. FILE - African migrants wear chains to represent slavery during a demonstration in Tel Aviv, Israel, April 3, 2018. Solomon Gebreyohanes left a small apartment to share another with three other men. 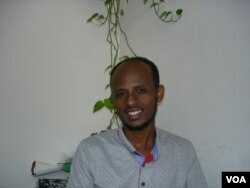 Gebreyohanes cleans offices and translates at Assaf, the aid organization. He used to film community events and edit them, but not anymore. In his current apartment, there is no room for his computer. "I can't make any noise," he said. 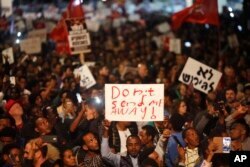 FILE - Asylum seekers protest against deportation in Tel Aviv, Israel, Feb. 24, 2018. Gebreyohanes fears asking his employers for proof that they have properly deposited his money. "They can fire me," he explained. An earlier version of this story misspelled Solomon Gebreyohanes' name. VOA regrets the error.